Remember the now defunct TickerSpy.com? I used it a few years ago to conduct some live experiments with random stock portfolios here on this blog. You can still read the results and conclusions here: Random stocks experiment. Just like science improves through experiment, a trader can improve from doing experiments as well. More on how and where a trader can experiment will be discussed further on in this piece, let’s first take our customary look at the market. 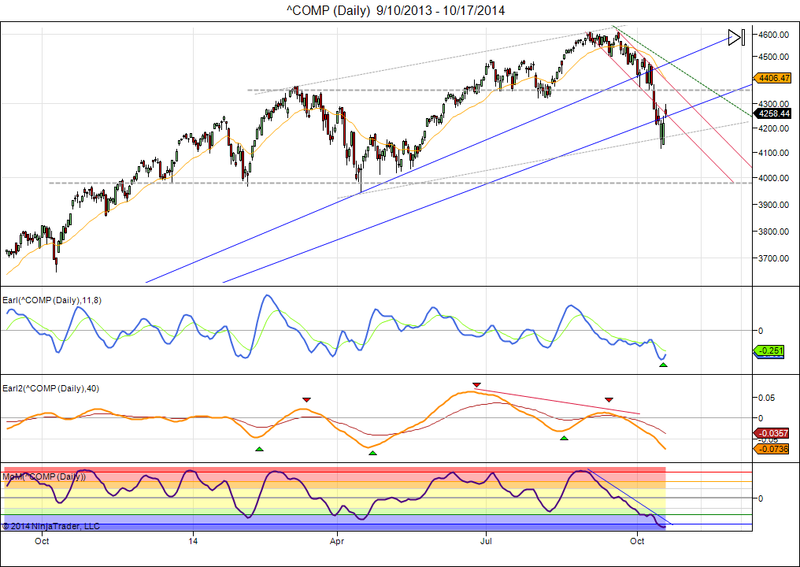 The Nasdaq has dropped below some important support levels in recent weeks. It has found a (temporary?) bottom on Wednesday and now appears to be bouncing back. I have been talking caution and standing aside for weeks, mainly because my Earl2 indicator (orange line) keeps dropping. Earl2 still doesn’t show any signs of turning up, but at least it is now in deep bottom territory and the faster Earl and MoM indicators are finally turning up from major lows. So, we can start to become a bit more optimistic at this point, but another quick drop to ~4000 cannot be ruled out yet. We remain in a lunar green period so I expect this to be a bouncing back week, with upside targets of 4350 and even 4450. What happens next will tell us whether we are in an ongoing correction/bear market or in a continuing bull market. But that will be a topic for the next weeks. This is still not a safe market (as if it ever is), but it is a bit safer to enter than the last weeks. Another topic that will start coming into play is the seasonal tendencies. Nearly everybody knows that stocks tend to perform very well in the autumn through winter period, and those seasonals have not failed to show up for 5 years in a row now. Buying with your eyes closed in Sep-Oct has been profits in the bank since 2009. Will the winter 2014-15 make it 6 in a row? If stocks start going up after the recent correction then many investors will take that as a signal to buy going into a strong period for the next 4 to 5 months. But could investing continue to be that simple? Or are the seasonal tendencies overdue for a hiccup? More on that next week. As I said in my opening remarks, experimenting can help an investor improve. There are many ideas we can try, we can experiment with different timeframes or with stocks we normally never buy, or we can just test to see what happens if we follow the recommendations of the pundits on CNBC. There is always something left to learn. How to do it? Well, experimenting within the comfort of our own PC is perfectly possible. But the disadvantage of trading experiments that nobody else sees is that we are doing it in a completely unrealistic “nothing to lose” setup. In a public experiment we put at least a bit of our reputation on the line, so it is more like trading for real money. TickerSPY closed down last year, but Scutify is now opening up very similar portfolio manager functionality in their new Hedge Fund Manager. They are starting today and I will participate with a few public portfolio experiments. It is open to everybody so feel welcome to join in with your own experiments. This entry was posted on October 20, 2014 at 9:23 am	and is filed under Financial Astrology, Market Commentary. Tagged: lunar cycles, Scutify, tickerSPY. You can follow any responses to this entry through the RSS 2.0 feed. You can leave a response, or trackback from your own site.